A fracture is the same thing as a break, there is no difference in the type or severity of the injury and the two words are interchangeable. There are many ways and areas in which the elbow can be fractured. Usually, it results from a fall directly onto the joint, or a hard impact. Sometimes it can happen from falling onto an outstretched hand or from a strong muscular force. The triceps muscle pulling in the Olecranon process at the back of the elbow is a common example of this. Due to several main nerves and arteries passing very close to the bones of the elbow, complications due to damage to these structures is common. Any elbow fractured should be fully examined to check for associated injuries. Symptoms include pain, tenderness and swelling over the front of the elbow joint. Non-displaced fractures can be treated with immobilisation in a cast for 3-4 weeks. Displaced bone fragments may require surgery. The patient will usually be holding their arm in a flexed position with the palm facing downwards. The forearm may appear shorter than the other one. Treatment usually involves surgery as the fragment is usually displaced. The patient complains of pain, swelling and a limited range of motion, It is common to feel a crunching feeling or sound when trying to bend the elbow. In non-displaced fractures immobilisation in a cast or splint is sufficient. If the fragment has become displaced then surgery is required. 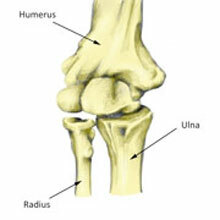 The Capitellum is the rounded lower end of the Humerus, which articulates with the Radius of the forearm. Fractures to this area occur most often through a fall onto an outstretched hand. Symptoms include pain and swelling at the front of the elbow. Most fractures are displaced and so require surgical fixation.